First, THANK YOU from the bottom of my heart for your kind, enthusiastic words about my big cookbook announcement! I can’t overstate how encouraged and joyful it makes me feel to know how excited you are for the book. I’m working so hard on the recipes, and I know you are going to love them too. In the spirit of the warm, cozy vibes going around, I have an equally comforting hug of a recipe to share with you: Instant Pot Beef Stew. It has the cozy richness you expect from the stick-to-your-ribs classic, made faster in the pressure cooker. 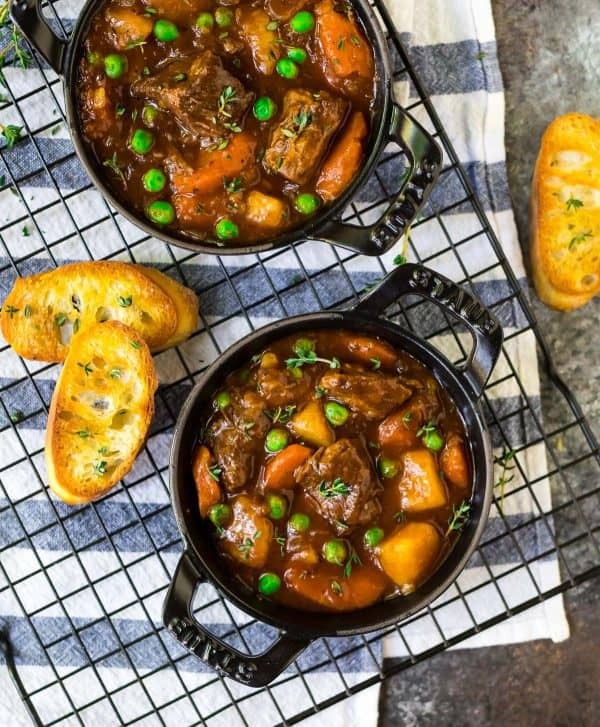 This recipe is an adaptation of my Crock Pot Beef Stew, which is one of my absolute favorite recipes to make on a chilly, cloudy Sunday when I can prep the beef stew earlier in the day, then take pleasure in allowing the meat cook low and slow until it is so fall apart tender, it slices with a spoon. Below, I have a handy guide for how to make an Instant Pot Beef Stew that will warm you from the tips of your ears to your toes. Brown the beef so that it gets that delectable crust. Crust = FLAVOR, so don’t skip this step. It takes a little bit of patience but will be well worth your time. Deglaze the pot and scrape up every brown bit. Deglazing both adds richness to the stew and ensures that you don’t receive the dreaded Instant Pot “burn” warning. I wrote the recipe for deglazing with beef broth to keep it simple, but you could certainly do an Instant Pot Beef Stew red wine deglaze instead. Sauté the veg. I loaded this soup with lots of healthy vegetables, so it truly can hold its own as an all-in-one meal. Everybody in the Instant Pot! Add all of the ingredients to the Instant Pot, seal, then set the timer and let the pressure build. This beef stew is also naturally dairy free and gluten free…though we couldn’t resist dipping ours with hunks of crusty bread. How Long Do You Pressure Cook Beef Stew? 35 minutes of high pressure (the manual setting), plus 10 minutes of natural release, yielded pieces of stew meat that tasted as if they’d been cooking for hours instead of minutes. Be sure you cut the meat to the size directed in the recipe to ensure this cooking time is right for you too. How Long Does It Take to Make Beef Stew in the Instant Pot? Start to finish, this recipe was on our table in an hour and a half. As discussed above, 45 minutes of that was the cooking and natural release. You’ll also need about 10 minutes for the pressure to build before the timer begins, as well as some time to brown the meat in batches prior to cooking the stew. Again, I promise it will be worth it! While that 90 minutes might not be *as* instant as a recipe name like “Instant Pot Beef Stew” suggests, in comparison to stovetop and slow cooker versions that take hours, the pressure cooker is still a fantastic shortcut. Thank you Instant Pot! Normally, the only way to achieve a melt-in-your-mouth texture with tougher cuts of beef (like the beef used for beef stew) is hours of low and slow cooking. The Instant Pot speeds that along. Because no moisture escapes, it locks tenderness into every bite of the beef. Every time I take a bite of this Instant Pot Beef Stew, I feel transported to a snug room beside a roaring fire in some windswept, drizzly, fairytale part of the world. The coast of Ireland perhaps? I can sense the heat of a fire and envision myself wearing a sweater (thick, woolly, and with a stereotypically charming Fair Isle pattern, of course). Instant Pot Beef Stew feels like the meal for that kind of night, when the rain taps on the window, but you needn’t worry. You are snug and the stew is hot and ready. 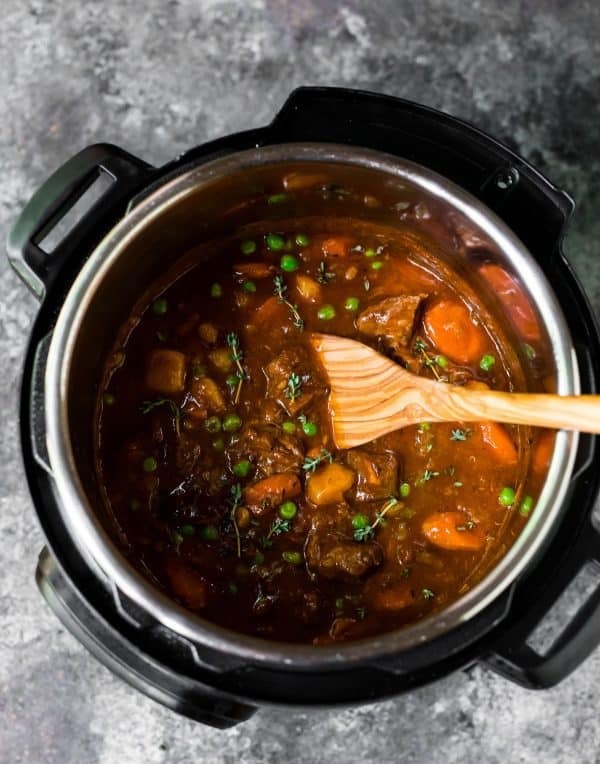 Easy, healthy Instant Pot Beef Stew. Fall-apart tender beef in the most flavorful sauce! Loaded with veggies, Paleo, gluten free, and Whole 30 friendly. Cut the chuck roast into 1 1/2-inch cubes, removing any large, tough pieces of fat or gristle. Turn the Instant Pot to SAUTE. Add 1 tablespoon of the oil. Once the oil is hot and shimmering (a drop of water should sizzle if added to the surface of the pot), add half of the beef, 1 teaspoon salt, and 1/4 teaspoon pepper. The cubes should be in a single layer and not too crowded so that they brown nicely. Let the cubes of beef cook undisturbed for 4 to 5 minutes (resist the urge to peek! ), until the bottom of the cubes develop a dark-brown crust and come away from the pan easily. Turn and continue searing until dark and brown all over, about 4 additional minutes. Transfer the seared meat to a clean plate or bowl. Add another 1 tablespoon olive oil to the pot. Once hot, add the remaining beef and remaining 1 teaspoon salt and 1/4 teaspoon pepper. Sear the remaining beef. If the pan gets too dry, add a bit more oil as needed. While the meat browns, dice the yellow onion. Mince the garlic. Peel the carrots and cut them into 1/2-inch-thick diagonal slices. Remove the second batch of browned beef to the plate with the first batch. Add the remaining tablespoon olive oil and the onion to the Instant Pot. Cook, stirring occasionally, until the onion begins to soften and browns, about 6 minutes. While the onion cooks, scrub and peel the potato and cut it into 3/4-inch chunks. If you haven’t finished cutting the carrots, do so now. Add the garlic to the Instant Pot. Cook, stirring constantly until fragrant, about 30 seconds. Add the beef broth and use a spoon to scrape the brown bits from the bottom of the pan. Make sure you remove every last bit of stuck-on food so that you don’t receive a “burn” warning. Stir in the carrots, potatoes, Worcestershire sauce, bay leaf, thyme, and the browned beef, along with any meat juices that have collected on the plate. Pour the tomato sauce on top. Do not stir again. Close and seal the Instant Pot. Cook on high pressure for 35 minutes, then allow the pressure to release naturally for 10 minutes. Vent to release any remaining pressure, then carefully open the lid. Remove and discard the bay leaf. In a small bowl, whisk together the cornstarch and water to create a slurry. Add to the Instant Pot and stir until the stew thickens. Add the peas and stir to warm through. Serve hot, sprinkled with fresh parsley. Store leftovers in the refrigerator for 4 days or freeze for up to 3 months. To make the recipe Whole30/Paleo compliant, swap arrowroot for the cornstarch and omit the Worcestershire (you can splash in some coconut aminos for extra flavor instead if you like). This was SO easy and delicious!! Will be sure to make it again! Whooo hoo! Thank you Saralee! 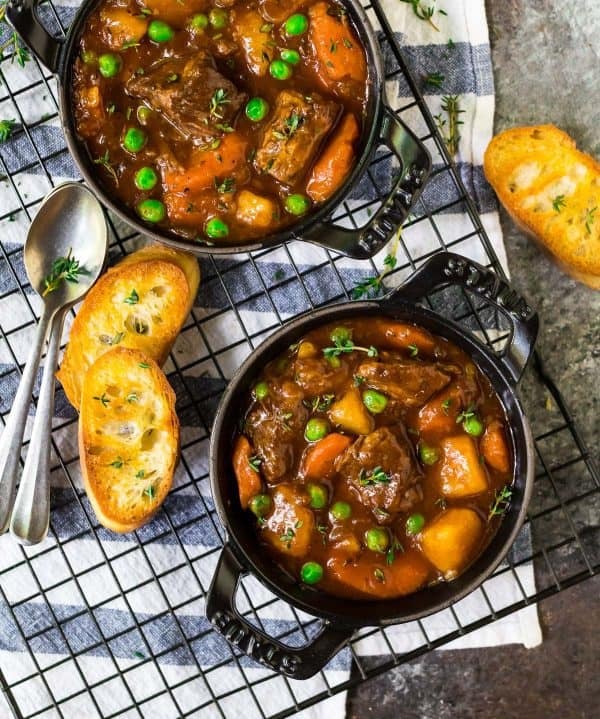 This beef stew recipe is to die for — and the best part is it’s so easy! The only thing I did different was to add a few stalks of celery and a green bell pepper because I wanted to use them up. The thyme and bay leaf give this stew such a great flavor. Thanks for another deliciously simple and healthy recipe! Hooray! I’m so happy to hear you enjoyed the stew, Nena. Thanks for taking the time to report back! Can I use the little round potatoes rather then the russet potatoe, this is my very first time using my multi cooker, this is Freida from Portland Oregon,,,! Hi Freida! I think if you cut them to be similar to the size the recipe describes, that would be fine. They might be softer, but I think they’d still be yummy. I hope you enjoy the recipe! This was SO good! I’m not a big cook, but this sounded so yummy and worth making. I’m so glad you enjoyed it, Echo! Thanks so much for giving the recipe a try! This was AMAZING! So easy to make and I’ll definitley be making it all winter long! YAY Ashley, I’m so glad you enjoyed the stew! Thanks for taking the time to report back. Can you advise if the cooking time should be less if the meat pieces are smaller? My family doesn’t like the big chunks?? Hi Cathy, the cook time may be slightly shorter if the meat pieces are smaller. I haven’t tried it myself, so I don’t have a specific time to give you, but if you decide to experiment, I’d love to hear how it goes! Hi Laney, if the beef is completely cooked and tender already, I would just stir it in at the end with the peas to warm through. I hope you enjoyed it! My husband loved it! The ease is amazing. I prefer a little more flavor and chunky potatoes so will tweak it as I learn the Instapot. Christina, thanks for taking the time to report back! I’m glad you enjoyed it! Made this tonight for my husband and in laws and we all really enjoyed it. Will for sure be having this again. Megan, I’m glad it was a winner! Thank you so much for taking the time to report back! This recipe is fabulous! Rich and beefy tasting. 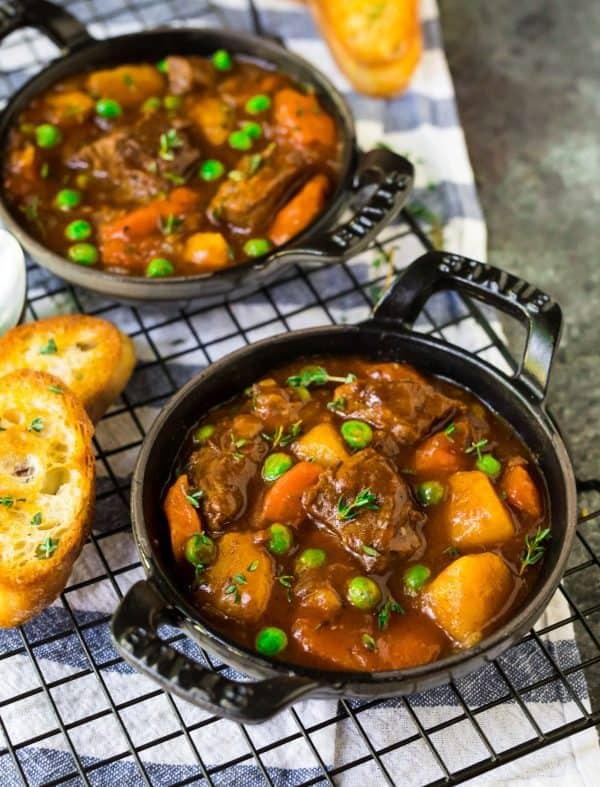 What I would consider the perfect beef stew recipe! I’m glad you enjoyed it, Diana! Thanks so much for taking the time to leave this review too! Amazing! I left out the tomato sauce but it was still great. Thanks for reporting back, Jenn! I’m glad you enjoyed it! The taste was great but the potatoes came out mushy. Next time I will cut a little bigger. The meat was great and tender! Kristin, thanks for reporting back! I’m glad to hear you enjoyed the stew. We had the stew tonight – big hit with my family! My 6 year old especially loved the meat, as he informed us he is a velociraptor and they love meat! I’m glad it was a hit, Crystal! Thanks so much for taking the time to review the recipe! Substituted radishes for potatoes (an extra low carb step), stilled turned out great! Thanks for reporting back, E! I’m glad to hear you enjoyed it! BettyAnn, I’m so glad you enjoyed this! Thanks so much for taking the time to leave this review too. Hi there! I’m making this tonight, and I just want to ask a bone headed question- when you say cook on high pressure for 35 min, are you using the manual setting or the meat/stew? Hi Art! Good question—I’m using the manual setting! I hope you enjoy! Hello! I was wondering if the one can of beef broth was the only liquid that you added to the instant pot, because it looked much more full at the end. Thanks! I’m going to try this tonight! Hi Natalie, that’s correct! I hope you enjoy the recipe. If deglazing with red wine is it a straight sub for the amount of beef broth you listed ? Hi Kate, I think about 1/2 cup would be good! You can just splash it in and eyeball it though. As long as you cook it down, you’ll be fine. I hope you enjoy the stew! Why do you put the tomato sauce in last on top and not stir rather than coating the beef with it first before adding stock and veggies? I am curious about the technique. Thanks. I will make this tonight. Great question Lowen! I find that helps avoid the dreaded Instant Pot “burn” warning, which tomato sauce can trigger. I hope you love the recipe! This was very quick to make and plenty of extra flavor from the bay leaf, thyme and worst. sauce. I used 32 oz of beef stock and tomato paste instead of tomato sauce. We love generous amounts of gravy. Next time will reduce tomato paste to 5-6 oz. Lynn, I am so pleased you enjoyed this!! Thanks for sharing this wonderful review and your feedback too. Thank you for sharing this recipe! This is only our second time using our IP, and this recipe was easy to follow and delicious. I’m glad you enjoyed the stew, Angela! Thanks for taking the time to leave this comment too! This looks so good! I wanted to make it and I have a 1 lb bag of those baby Dutch yellow potatoes. Do you think I can use those instead of a russet? I’m just a little over russets .. if so, how many and how do I prepare them? Thank you! Hello! I think you could use those potatoes—just cut them in half or quarters as needed to be roughly 3/4-inch pieces that the recipe calls for. Half the 1 pound bag would probably do it, but you can adjust depending on how much you like potatoes! I hope you enjoy the stew! looks great and I plan on trying tomorrow. What are your thoughts on adding mushrooms? This will be my maiden voyage with the instant pot- so feedback would be much appreciated! can’t wait to try this! Hi Melissa! I think mushrooms would be delicious. I hope you enjoy! Hello, and thank you for the recipe. It looks delicious. What is the cook time if you double the recipe? Hi T, I have never tried doubling this recipe, so I’m afraid I don’t have any specific guidance. I hope you enjoy the recipe if you decide to experiment! I doubled some things, but not others so that it didn’t go over the fill line. I kind of winged it. I 2.5X the recipe, and I set it on the “stew” setting of my Instant Pot and it still said 35 min of cook time. However, the time to get to pressure with my pot almost to the fill line was like 30 min. I wish I would have timed it exactly for you guys, but just know it takes about two to three times as long to reach pressure with more food, but the actual cook time remains the same for those of you setting the cook times manually. Also I used my stew (after straining most of the broth) to make beef pot pies 🥧. This recipe worked very well in pie crust! Josipa, thanks for chiming in and so glad you enjoyed it! Truly delicious! This may very well be the best beef stew I’ve had…despite the fact that I made a stupid error and inadvertently used Asian dumpling sauce instead of Worcestershire, (similar size and shape bottles stored next to eachother ). I cant wait to make this again with two changes; use Worcestershire Sauce as directed and double the recipe! I am so so happy you loved this! Thanks so much for reporting back! If I wanted to use fresh green beans, when would I add them in? Theresa, I am honestly not sure that the green beans would hold up to pressure cooking without turning to mush (and simply stirring them in with the peas at the end would leave them too crisp). I’d suggest blanching or sauting them separately, then stirring them in at the end. I hope you enjoy the recipe! This stew was fabulous, I think it may have been the best beef stew I have ever made. Great start for my new Instant Pot. I’m glad to hear it, Mary Ellen! Thanks for taking the time to leave this review! Great recipe! I pretty much cut it in half (I have 3 qt Lux Mini) and subbed the thyme/bay leaf for a half a branch of fresh rosemary. Then added some tomato paste after sauteing meat, onions and garlic for a couple mins. The corn starch at the end really helped, too. I also added celery, but it was overcooked and didn’t really add much. Want to try some mushrooms next time. Having said all that, it was a really good stew and I can’t wait for leftovers! I’m glad you enjoyed it, Seb! Thanks for taking the time to leave this review! This is a pretty solid recipe. The tomato comes through a bit stronger than I’d prefer, but that’s easy to adjust. But you need to be aware of this warning: This Stew will make you fall asleep almost instantly. I know that sounds like hyperbole, but I assure you it isn’t. You should treat consuming this stew like you’re consuming a bottle of grain alcohol. Do not operate a vehicle. Do not be responsible for the life of a small child. Don’t do anything that you need to not be asleep for. Some people might read this as “you’ll want to nap”. Nope. Naps are for babies!! This stew will make you enter a 7-10hr hibernation. It’s. Awesome. I’m glad you enjoyed the stew, Matt! Thanks for taking the time to share this review. This recipe turned out absolutely delicious! Will definitely become a favorite for my family. Hooray! Thanks for taking the time to review, Kathleen! I’m glad you enjoyed it, Ramona! Thanks for leaving a review!! Delicious and exactly as pictured/written about. Everyone loved – this made our “keeper” list unanimously! YAY Sunnie! I’m so happy to hear this. Thank you for taking the time to review the recipe! Eli, I’m afraid you do need to use tomato sauce for this, as it gives the soup the right consistency. You could use the chicken broth you suggested though! This is by far the best beef stew I ever had.More amazing I made it from a very easy recipe. Dan, that is wonderful to hear, thank you!! First meal made in my new Instant pot and it was AWESOME! Great flavors and easy to make. WHOO HOO Mike! So happy to hear how much you enjoyed it. Thanks for taking time to leave this review! Hi Marsha, you could try it, but I find the extra flavor is worth it to sear it. I’m glad you enjoyed the stew! I made this and it was tasty . I added 2 celery stalks cut in 1/4 inch to 1/2 inch. I also used i can of peas and about 3/4 teaspoon flour and made a roux instead of cornstarch. Mary, I’m glad you enjoyed it! Thanks for taking the time to share your tweaks too! This was the second recipe I tried in my new IP. Wow, Amazing! It was so tasty and just the way I like my beef stew. Thank you for such a great recipe. I will be making this again and again. Hooray! I’m glad you enjoyed it, Jen. Thanks for taking the time to report back! Absolutely delicious! I had never found a good beef stew recipe until this one! The meat was so tender and the flavor of the stew was out of this world! Keep the recipes coming. I have followed so many of your recipes and recommend them to others. I just got the Instant Pot over the holidays. I am loving it! Thanks for taking the time to report back, Melody! I’m so glad you enjoyed the stew. Thank you so much for this kind comment too! This was my first Instant Pot recipe also and we loved it. Did you mean to put only one potato down? I used 4 but pulled out a little when it was done so I think i would have been good with 3. Hi Judy, I only used one large potato but you can definitely customize to your preference! I’m glad you enjoyed the stew. Can I still make this if the meat is frozen? If so, how much longer should I cook? Hi Hope! I haven’t tried this myself so I don’t have an exact time to give you, but other similar recipes online added about 10 minutes to the cook time. It really depends on the size of the beef. Note that the other vegetables may be more cooked and softer/broken down if more time is added. If you decide to experiment, I’d love to hear how it goes. We made this for dinner tonight. I like the flavours and the beef was awesome. Only issue we had was I couldn’t get it to thicken. Any suggestions for the next time we try it? We did add the cornstarch slurry but it was still very watery. Hi Lindsay, I’d add a little extra cornstarch to the slurry next time. I’m glad you enjoyed it! Erin, thanks for this easy and delicious recipe. This was the first time I’ve made beef stew in the instant pot, and I couldn’t believe how flavorful it was because the recipe was so simple, with just very basic ingredients. I was worried because there seemed to be so little liquid in the pot, and most of the beef was not submerged in the broth, but I didn’t get that dreaded “burn” warning, and when I opened up the lid after it was done, everything was gorgeous. I’ve never made a beef stew this good in a slow cooker or a regular dutch oven. Now I’m going to check out all your other recipes! Thanks so much! Jonathan, thank you for taking the time to review the recipe! I’m glad you enjoyed it, and I hope you find many other new favorites too. I just received my instant pot and this is the first recipe I’ve tried. I have an extremely picky bunch of eaters in my family, and they all LOVED it! Jennifer, I’m glad it was a winner! I hope you find many more new IP favorites too. This was delicious. I used some red wine along with the beef broth when “deglazing” the pot. I halved some mushrooms and threw them in the pot with the veggies. Added frozen cut green beans at the end since my spouse doesn’t like peas. Will definitely make this again! Tina, thank you for taking the time to report back! I’m glad you enjoyed the stew! I follow this exactly, and it is way overcooked, the potatoes and carrots basically turn to mush. A friend of mine used the same recipe and after talks go to her she had the same results. I knew when it called for 35 min in pressure cooker it seemed too long, and it is. Hi Mak! Thanks for reporting back. Many readers have tried the recipe as written and loved it, so I’m sorry to hear it came out overcooked for you. I’d recommend making the pieces larger next time if you decide to give it another try. I know it’s disappointing to try a new recipe and not enjoy it, so I truly wish you would have loved this. Very disappointed in the recipe. Followed the recipe to a T. It did not look very appetizing when finished cooking. It looked all mushed together. Hi Lorraine, I’m sorry to hear you didn’t enjoy how the stew looked! Many other readers have tried the recipe and enjoyed it, but I know everyone has different tastes. I know it’s disappointing to try something new and not have it come out as expected, so I truly wish you would have loved this. Mine is still cooking. It seems to be taking a very long time to build up pressure. How Long should I expect? Going on 30 min now! Hi Melanie! How long did it end up taking? Mine usually takes around 10 minutes to come to pressure. Thanks stew was awesome. I added petite corn green beans and peas after done . Soooooo excited to hear this Mike! Thank you for trying it and for taking time to leave this lovely review! Made this tonight. Delicious recipe! Patricia I am so pleased to hear that you enjoyed it. Thanks for letting me know! Best beef stew I’ve had. I didn’t have an onion or fresh garlic so subbed onion and garlic powder. Also added more potatoes and broth and it was FANTASTIC!! Ashley, thanks for taking the time to leave this review! I’m glad you enjoyed this! This was my first time making beef stew, and as usual, your recipe did not disappoint! The effort to brown the meat in batches was 100% worth it for the amazing, rich flavor. This stew was absolutely perfect for for feels like 6 degree cold snap we’re having in Philly, and I’m so glad I finally made it. Your blog is definitely my go to for new recipes and recently, travel tips. I just went to Florence over the holiday and as suggested, La Carraia was our favorite gelato find! Loved this dish! I used 4 teaspoons arrowroot to 2 tablespoons water, and did half red wine half beef broth, and it turned out great. I did feel it needed a little extra seasoning (salt/pepper) at the end, but overall super delicious! Thank you! Megan, thanks for sharing your tweaks! I’m so glad you enjoyed the stew! Thank YOU for taking the time to report back, Kelly! I’m glad you enjoyed it! Just received this instapot, actually it’s a potastic. My first attempt was cooking a whole chicken and it wasn’t near as tasty as done in an oven. So I tried your stew recipe mostly following your instructions, but I never really measure anything. I did add celery. OMG, awesome!!! Winner winner non chicken dinner. Ok, I’ll keep this new contraption. Next time I’m going to add water chestnuts just because we like their texture. Thank you. Carla, I’m so glad this recipe was a hit! Thanks for taking the time to leave this wonderful review! I rarely follow a recipe 100% but this one is just perfect the way it is! Hooray! Thanks for sharing this review, Sarah! This stew was very tasty but after reading some of the other reviews I made sure to cut the carrots and potatoes into large pieces. I also cooked it for 30 minutes to make sure it didn’t turn to mush. It turned out great but I can see how it could easily get over cooked. The meat was amazingly tender. Nicole, I’m so glad you enjoyed it! Thanks for sharing your tips! How much sodium is in this? How can I lower it . I use low sodium beef stock anything else?? Hi Kathy! The recipe does use low-sodium beef broth and no-salt-added tomatoes. If you’re interested in the sodium content, there are free online calculators such as MyFitnessPal that you can use! You can plug in the URL of this post and it’ll bring up the ingredients, which you can customize based on the specific brands you use. I hope that can be a helpful resource for you! The beef stew is amazing, the layering of flavors and cooking it all in the Instant Pot, so good! I have a question, I have the 8 quart do well, and I got the dreaded burn notification with about 13 minutes left on the cooking cycle. It would cool down and continue cooking and then get the burn notification and did this off and on until it finished with natural pressure release. I opened it and there was no liquid left in the pot. The meet was still tender and the vegetables were done, but there was no liquid. There truly was a burned bottom. This is the third recipe I have made where I get the burn notification because there’s no more liquid or no burn but there’s not as much liquid as what the soup should have had. Do I need to adjust liquid measurements because I have an 8 quart? It also took almost 30 minutes to come to pressure, where I’m reading that it should’ve taken 10. Lorelei, I test all my recipes in a 6-quart, so I’m afraid I’m not experienced with how things convert to the 8. If you are having this problem regularly, I’d suggest adding more liquid to your recipes going forward. I’m sorry I can’t be of more help! You could try referencing conversion suggestions online too. Thank you! I’m hoping my pot isn’t broken, or I’m doing something wrong. Does steam come out even when the knob is on sealed? Mine comes out a lot when under pressure. Just curious about it all. What can I sub for tomato sauce? Hi Judi, you could mix tomato paste 1:1 with water to make 8 ounces and use that. I hope you enjoy the stew! This was delicious! I added mushrooms and used whole baby carrots and halved baby Yukon potatoes. I also added rosemary and doubled the thyme and the worchestshire. I was afraid it would be mushy but the texture of the meat and vegetables turned out perfectly. I Used an extra tbsp of cornstarch because I like my stew thick. I will definitely make this again! YAY! Thanks for reporting back, Michelle. I’m glad the stew was a hit! This was sooooo good and super easy to make! I am horrible at cooking generally and have never been able to follow a recipe. Luckily, Erin makes this incredibly user friendly and easy. I can’t say enough good things. Woohoo! I’m happy to hear the stew was a hit. Thanks for sharing this review, Lauren! So delicious and easy to make. It was enjoyed by the whole family. I will definently make this again. I’m glad it was a winner, Mary! Thanks for sharing this review! Amazing stew. I browned the meat in two big pans and deglazed with the vegetables and liquid before adding it all to the instapot. The flavors of the stew was so good. Will definitely use this recipe again and again. Susanna, I’m glad it’s a winner for you! Thank you for taking the time to share this review! This was the most delicious beef stew I have ever made and I have tried several recipes. Most turn out too thin, some too gummy, but the consistency here was just perfect . I had two pounds of stew meat so I added one more carrot, 3 stalks celery, used two potatoes (unpeeled) and 16 ounces of beef stock. I tossed the meat with generous salt and pepper befor sautéing but other than that, followed the recipe exactly. I am curious as to why leaving the tomato sauce “unstirred” makes a difference? But I am sold. I will make this again and again!!! Laurie, I’m so glad to hear this recipe is a winner for you! Thank you so much for taking the time to leave this awesome review. YUM. I made this last night. I used half beef broth and half red wine to deglaze. I also omitted the thyme because I didn’t have any! The meat was tender, the sauce was rich and packed a flavorful punch. I don’t normally comment on recipes, but I wanted to go the extra mile to do this because it turned out better than expected. Emily, I truly appreciate your taking the time to comment! I’m glad to hear you enjoyed the stew! After a medical scare am looking to make significant lifestyle changes. One of those is to eat healthier. The Instant Pot has become a vital tool and this recipe has earned a place in my new food file. Even using low sodium, low fat ingredients it has a remarkable taste and is surprisingly filling after only one bowl, even though I failed to follow the recipe exactly (we got ahead of ourselves and didn’t sauté the onions and garlic). I have a feeling this and other recipes from your blog are going to play a significant role in my eating life going forward. Jim, thank you so much for the kind words and for taking the time to leave this review! I hope you find many new favorite recipes. The meat & veggies were cooked to perfection but the sauce was ick. I will not be making this again. For the amount of prep it would have been just as easy to make this in a crock pot. And it would’ve tasted a whole lot better. Jillan, this has been a favorite of many readers, but I’m truly sorry it didn’t work out for you! I know it’s disappointing to go to the effort of a new recipe and not have it come out. If it had an off taste, my hunch is that some garlic or oil might have burned, which can throw off the flavor of the whole dish. I do have a crock pot beef stew if you’d like to try that instead: https://www.wellplated.com/crockpot-beef-stew/. This is a great recipe! Thank you for sharing. I’m glad you enjoyed it, Ev! Thanks for taking the time to leave this review! I know you probably have never done this but could I switch the beef for mushrooms and the beef broth for vegetable broth? Trying to make it vegetarian. Hi Kimberly! You’re correct that I’ve never attempted that, but you could certainly give it a try. The only thing will be adjusting the timing—whole mushrooms will not need nearly as long to cook as beef. If you do decide to experiment, I’d love to hear how it goes! I lived the recipe and have a question: if I want to double the amount for a larger group of people, do I have to double both the ingredients and cooking time or ingredients part only? Hi Madina! I have not experimented with doubling the recipe, but you likely would not need to double the cooking time. I would start with the same cooking time and let it rest longer or add a little more time if it’s not finished cooking yet. You’ll also want to make sure that the pot is large enough for a double batch. If you decide to experiment, I’d love to hear how it goes. I have been making beef stew for decades. Your recipe is, hands down, the best beef stew I have ever made. So easy to make in the instapot. Thank you for giving us this recipe! Kathy, that’s a wonderful review—thank you! I’m glad to hear you enjoyed it. This came out great!!! Looks just like the picture! Tasted delicious. I decided to sauté my meat, onions and garlic in a pan – seemed simpler. I put in a little more garlic. Kim, thanks for taking the time to report back! I’m so glad it was a hit! Hooray! Thank you for taking the time to share this review, Lena! YAY! I’m glad it was a hit, Gina, and I so appreciate having you as a reader and Instagram follower! Delicious! First time visitor to your blog and this was a hit! I mixed some of the broth with about 2 TBSP of tomato paste and poured over the top of the meat. I think not stirring after adding the tomato is a great idea! I also used coconut aminos vs Worcestershire sauce as you mentioned. Didn’t add the potato because I served over mashed potatoes. I seasoned at the end with Herbamare and left out the cornstarch (I like a thinner sauce over the mashed potatoes). I’ve made a lot of beef stew recipes and this is my new favorite. Thank you!! Jessica, I am so pleased to hear it. THANK YOU!